Benji B (pictures below) is a jack of all trades. On BBC he spreads the latest Dubstep, Hip Hop, and Broken Beats rhythms during his notably radio show. On his monthly Deviation party he does the same but mostly together with guests such as Sa-Ra Creative Partners, Moodymann, or Flying Lotus. In between he travels the world to represent the oldskool era while giving a voice to newskool. Thats why we thought he might be the perfect proband to test our CARHARTT X UDG DJ Bag en route. After a testing phase we hook up with him to ask some questions about his daily DJ grind and his experiences with the CARHARTT X UDG DJ Bag. How did the digital revolution change your personal way of DJ-ing? Benji B: Well, years ago I used to cut my own dubplates for DJ because that was the only way to get fresh stuff for my sets. Now I play mostly cd’s with fresh stuff because most of the music I play isn’t out yet. But I still carry vinyl – for the sound at least! What’s your favorite format, vinyl, cd or mp3? Benji B: I like cd’s for the fresh and unreleased stuff. Also in terms of looping and pitching it is better. But I love vinyl and will always support the format, in many cases cd’s can save also your life. Like on Festival stages, who shake often, it is better to have cd’s. What do you think a DJ set-up will look like in the year 2020? Benji B: I think it will not look so different then from today. Serato Scratch is probably the most technologically advance music working on that to make it more proper. But the rest will look the same I think. Serato revolutionized DJing especially Hip Hop. Hip Hop vinyl isn’t pressed up as much as it used to be. Maybe on underground labels, but major artists don’t do vinyl’s anymore! Techniques and technology always develop. But I think there will be still a need for a DJ, a selector who plays his personal journey. The machines will not take over! What’s your most favourite DJ location? Benji B: My Deviation night in London every first Wednesday of the month! It is the best place in the world for me and the best crowd, too. 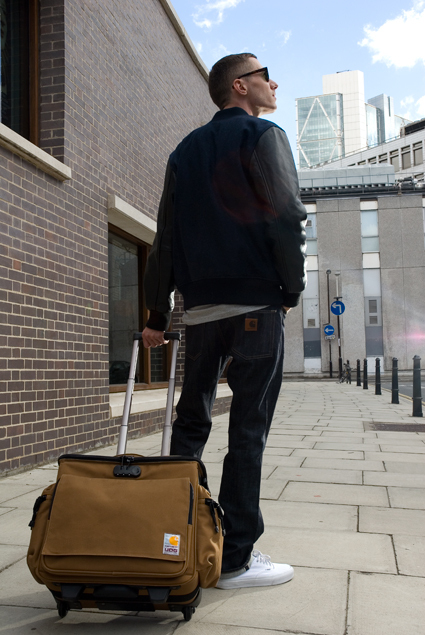 Where did you use the Carhartt X UDG bag for the first time? Benji B: In Lithuania on a festival in the woods! Did you encounter any problems with your bag as a carry-on item? Benji B: I just tested it a little bit. It is a little bit bigger then the usual UDG bag because you can put a 15-inch laptop inside which is really great for me. But this can cause problems in case you fly with budget airlines. But with the normal airlines all is ok.
What would you change or add to the bag? Benji B: It looks pretty perfect but I have to see when I used it for a while. But it is nice with all the bags especially when you have only one gig because you can bring just the little things you need like socks and a shirt. Anything else you would like to comment on? Benji B: I think that the use of canvas makes the bag a little bit heavier then the normal one. But I like it because it is the classic Carhartt canvas that was always my favorite. Wonder how it will look after I used it for a while… .